Sky 3D TV channel to close in June | What Hi-Fi? Another nail in the coffin for 3D, as Sky announces it will be removing the Sky 3D channel and putting all its 3D content on to the On Demand service. The Sky 3D channel will be removed in June and all of the 3D content will instead only be available on demand. Sky is promising "over 60 shows and movies available On Demand in 3D". 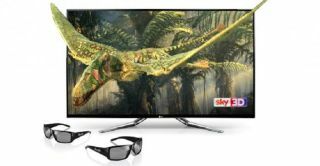 Sky's 3D channel has previously shown blockbuster films such as Avatar and documentaries such as David Attenborough's Flying Monsters. Currently the channel broadcasts in the evenings showing a mixture of TV and film content, alongside on demand 3D content. The news was announced in a blog post by Luke Bradley-Jones, brand director, TV products, who did his best to put a positive spin on the change: "From the latest 3D movie premieres like Guardians of the Galaxy, X-Men Days of Future Past and Dawn of the Planet of the Apes, to the very best in natural history with documentaries like Natural History Museum Alive, it will all be ready and waiting for our customers to view whenever it suits them. The changes to 3D are all part of making our on demand offering a fantastic destination for customers." Sky says TV package prices will not be affected and Sky 3D programmes will now be found in the respective areas of On Demand - Sky Box Sets, Sky Movies and Sky Store – with each section getting a new 3D area within the menu. Sky recently revealed almost 7 million households are now connected to the On Demand platform, with on demand downloads up more than 60% year-on-year. Last September it was revealed that there would be no live football in 3D on Sky this season, and it's now hard to see Sky committing to shooting fresh 3D content with the plug set to be pulled on the linear TV channel. The BBC ended its 3D broadcasts back in 2013, citing a lack of appetite from the public for 3D, and now the amount of 3D content being broadcast looks likely to take a further hit this summer. BT Sport doesn't offer any 3D content, while Virgin Media only offers 3D films and TV shows on demand.